Plenty of storage in safe condition. This case is very sturdy and with four locking catches makes for the lid not falling off in transit. The inside of the case is one solid foam block, pre sliced into small squares. You can remove any number of the squares so that the foam padding firs snugly around the camera and its accessories. I still have room after storing the camera, four lenses, filters, cleaning kit and battery charger. When I run out of room I shall order another of these cases. Surch High quality and v.f.m. The foam layer with cut outs, needs to be cut less deep, but the strength of the case is very good. The case is very strong and comfortable to carry, and the padding is plenty for protection, but the foam that has been cut is cut too deep, and when you access the camera and other gear stored in it, more foam pieces break off. I will have to get another sheet cut to replace the one that came with the case. However, that said, it is a very robust case and I would have no problem traveling with it. Stronger and more robust than i imagined. 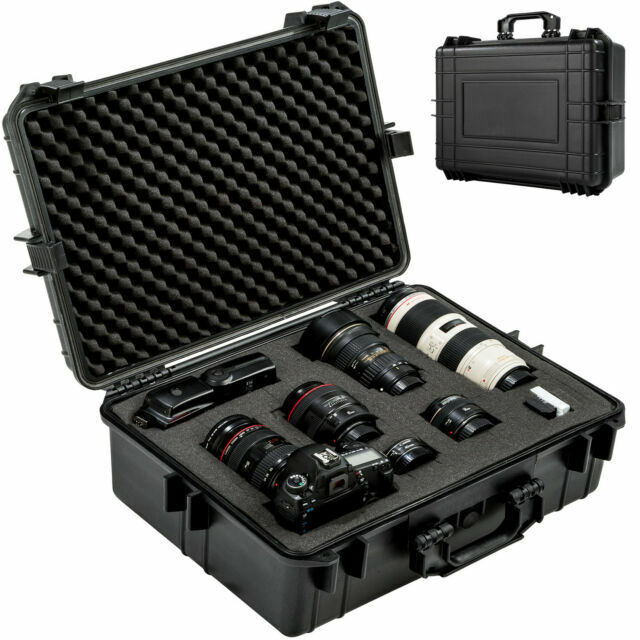 If you have expensive dslr cameras and lenses, and you want 100% confidence that they will be protected in a strong case, then i highly recommend this case that i have just purchased. Its extremely tough and sturdy and also has a hole on either side of the front locks, that you could attach 2 good combination padlocks for added security. The holes look to be approximately 5mm in diameter, but measure them your self if you purchase this case. I was at first skeptical about the quality of this case because the price was very reasonable. After receiving It cleared all doubt. I am very happy with the construction of the case, the quality and the paid supplied are all great quality. If you are having any doubts I can tell you that you will be happy with this. For the price it is very very good. I will definitely be buying more. I successfully put in ; 2 x Canon 5D MARK III 6 x LP-E6 Batteries 2 x GoDox Ving 850 1 x Canon 70-200mm f2.8 L IS USM 1 x Sigma 24-105mm f/4 OS Art And I still have space to put in another lens. Thankyou very much for this hard case. It is perfect.